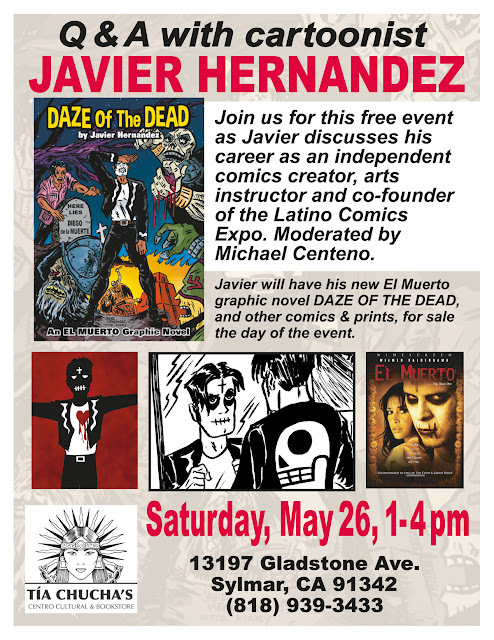 Exclusive edition of MANGA MUERTO at Latino Comics Expo Modesto! I'll have a limited Latino Comics Expo Exclusive Edition of MANGA MUERTO: The Classic Collection available this March 15 & 16 in Modesto, CA! 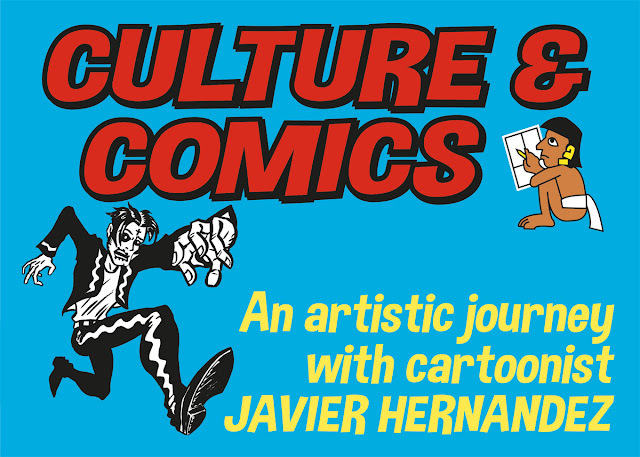 You might know that I'm the co-founder of the Latino Comics Expo, begun back in 2011 at our first event at the Cartoon Art Museum in San Francisco, CA. Since then we've done a total of 8 shows across California and last year we even went to Brownsville, TX! 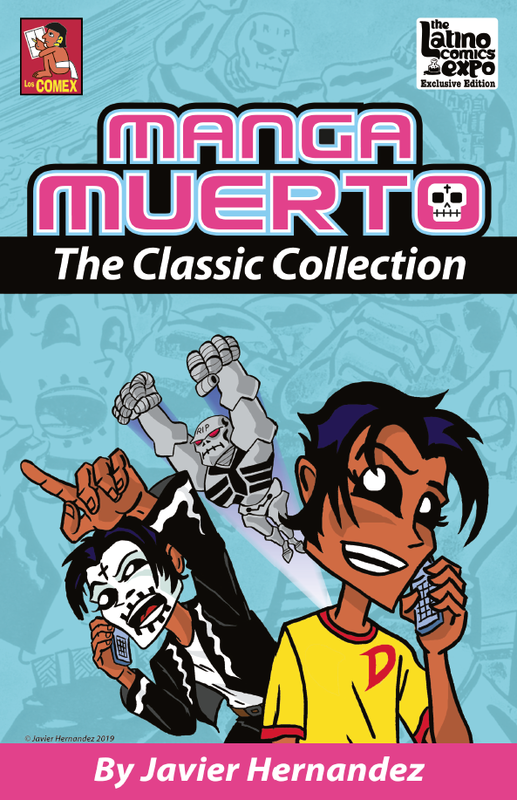 For this year's event at Modesto Junior College, I've got a new edition of last year's sold out collection of the 3 original Manga Muerto comics. It's going to be another great show with a lot of fantastic guests. One of the artists visiting us from Indiana is Jorge Garza, an amazing talent I'm looking forward to meeting. 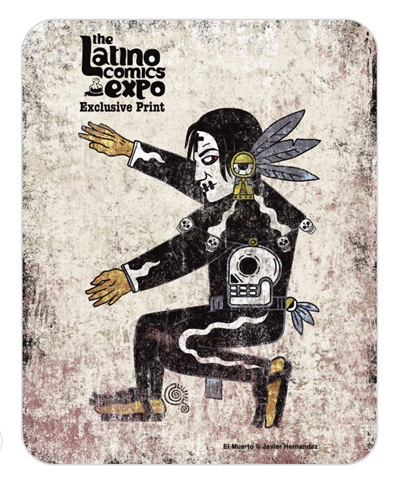 In fact, I have an exclusive partnership with Garza this year: He's created a special print of El Muerto done in his Azteca Pop style! 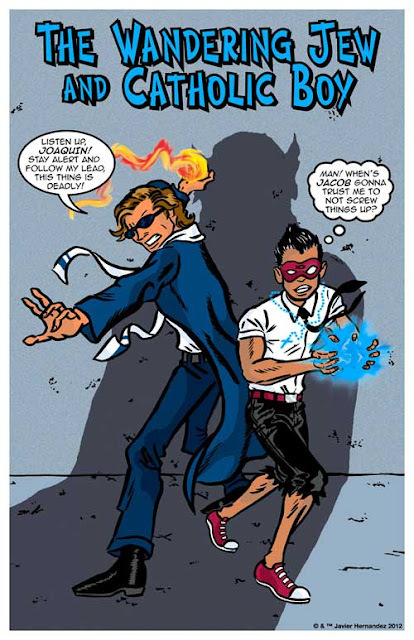 This is a fantastic piece, and to be honest I haven't ever commissioned an exclusive El Muerto art print created by another artist. So this will be available in limited supply by Jorge at the show, but if you won't be out on the West Coast to visit the event, you can actually pre-order from Jorge's shop and he'll ship it out after the event. If you're considering getting this fantastic image, please order it and support his efforts! Thanks and see some of you in Modesto next weekend! 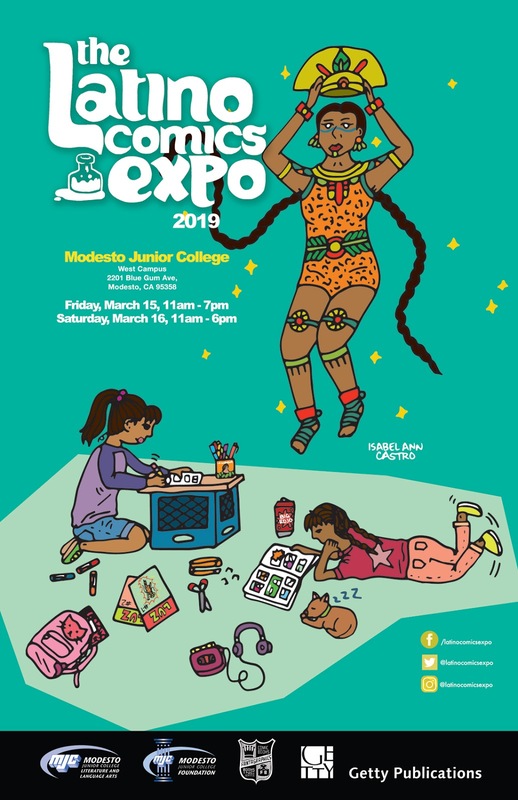 Latino Comics Expo coming to Modesto Jr. College March 15 & 16! 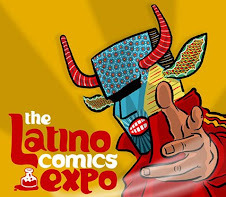 We're hosting our next Latino Comics Expo this March 15 & 16 at Modesto Jr. College in Modesto, CA. Hope to see you there. 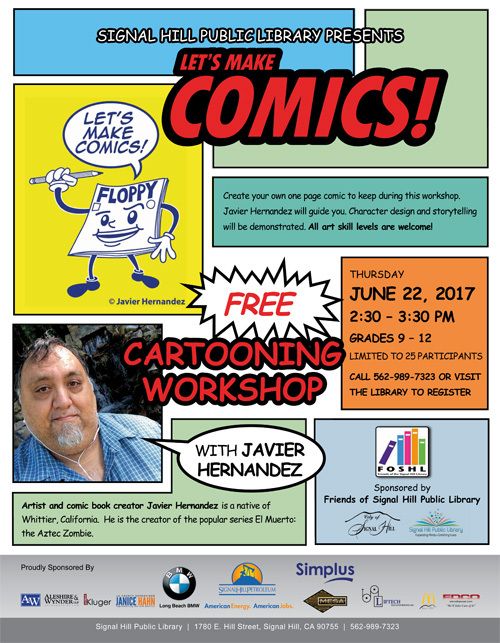 Admission is free and all are welcome to attend this family friendly event. Check our page for details! 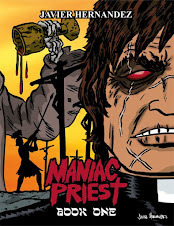 New comic SAINTS AND SINNERS available for pre-order! SAINTS AND SINNERS is being produced to debut at the upcoming ALPHA OMEGA CON. 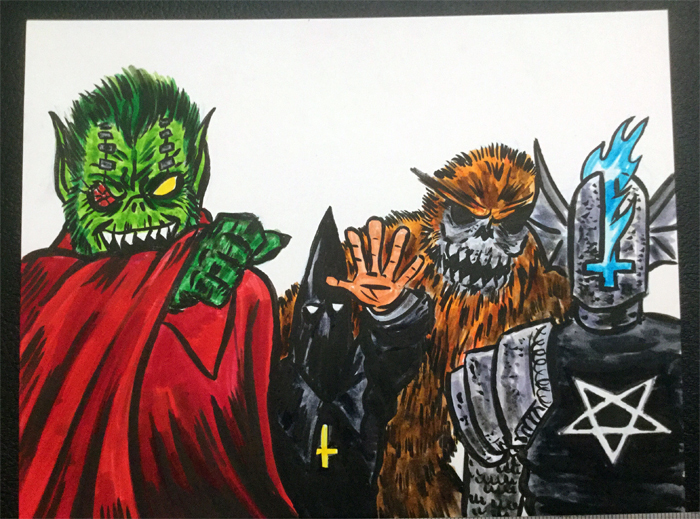 It's a Christian comics & pop culture convention taking place on September 23 in Artesia, CA.I attended last year and was invited to return, so for this year I got the idea to do a collection of some of my characters who's supernatual themes would have a particular appeal to this audience. 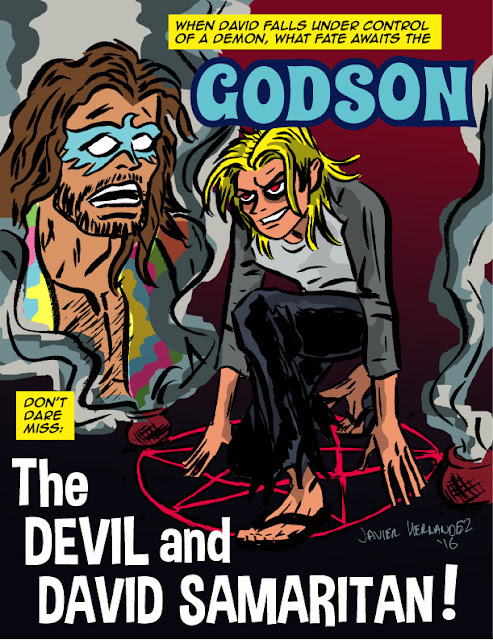 The four previous stories that are being reprinted are the supernatural vigilante Maniac Priest, the possessed exorcist Demoniak, the demon-fighting duo of Jacob & Joaquin: The Wandering Jew and Catholic Boy and the hippie Jesus freak superhero Godson (who previously appeared in a Poster Comic, so this marks the character's first time in a printed book). 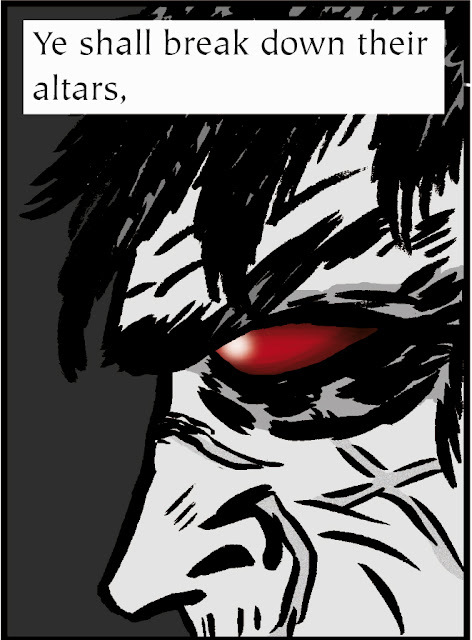 And acting as host to these stories is a brand-new character of mine Ann Hellika, Hell's Belle! The newly created pages will introduce the other stories and give you a glimpse into her world. I'm running the pre-order campaign until Labor Day. This comic will actually be printed in a new size for me, a hefty 9" x 12" format! 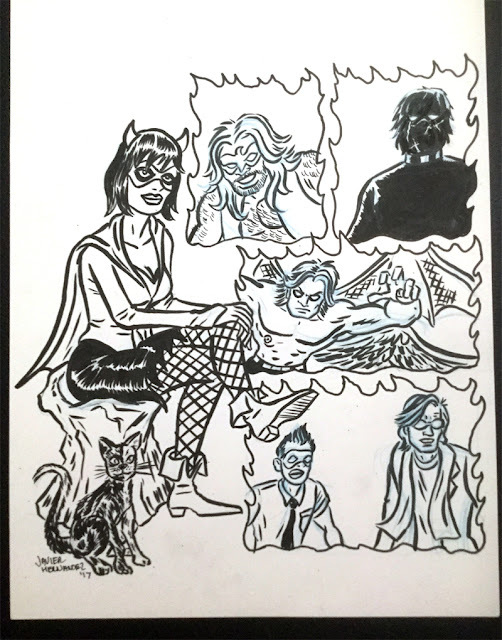 20 pages, full color, and in addition to those comics there will be a gallery of production & promotional artwork, similar to some of the pieces seen here. In addition to pre-ordering the comic (which will come with a free mystery print! ), I'm also offering the original cover art as well as the back cover artwork. 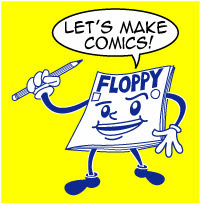 So if you want to get your hands on some original hand-crafted comic book art, now's the time to jump in. So if you're interested, I'd appreciate your support! Thanks. 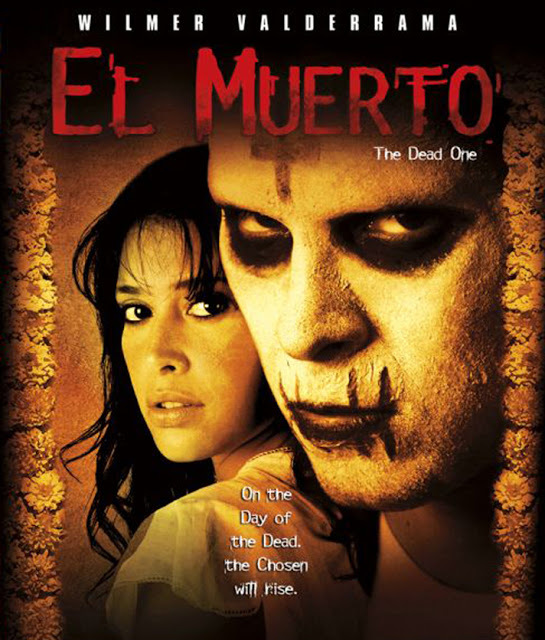 As a fundraiser for the Latino Comics Expo (of which I'm co-founder), we will be screening EL MUERTO on Sunday, August 13 at The Frida Cinema in Santa Ana, CA. 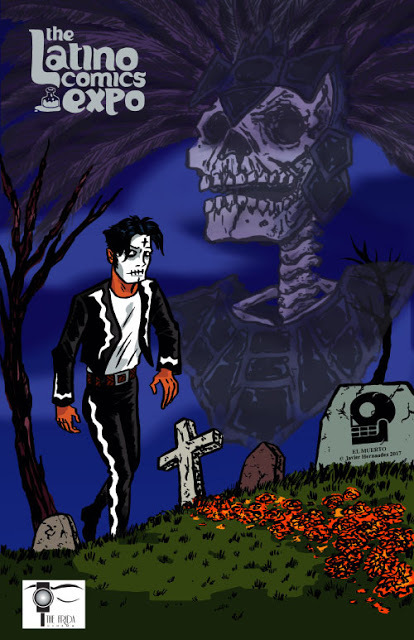 Based on my comic book, EL MUERTO tells the tale of Diego de La Muerte, a young man killed and resurrected by the Aztec god of death on the Day of the Dead, tasked against his will with performing an evil act. The film stars Wilmer Valderrama, Angie Cepeda, Joel David Moore, Tony Plana, Maria Conchita Alonso and Michael Parks. 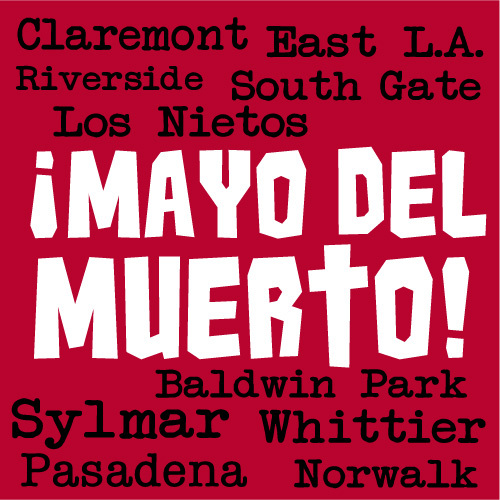 The screening takes place Sunday, August 13 at The Frida Cinema, Orange County's premiere arthouse cinema showcasing independent, foreign & classic films. Following the film will be a Q&A with screenwriter/director Brian Cox and me. All attendees of the screening will receive a free commemorative color print I produced for the event, plus there will be raffles for rare El Muerto comics, prints and even original artwork. 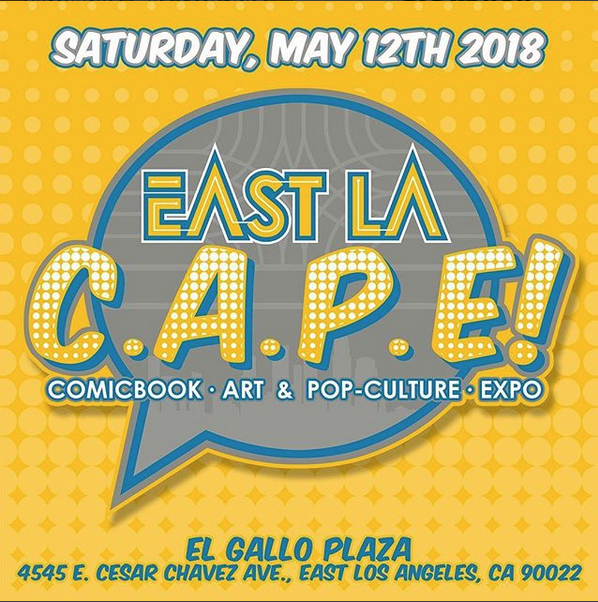 The fundraiser will help raise money for the Latino Comics Expo, the nation's premiere convention dedicated to showcasing Latino comic creators, writers and artists, as well as others working in related popular arts. This year's Expo will once again be held on November 11 & 12 at the Museum of Latin American Art in Long Beach, CA. Pre-order your tickets at our Eventbrite page and make plans to join us! 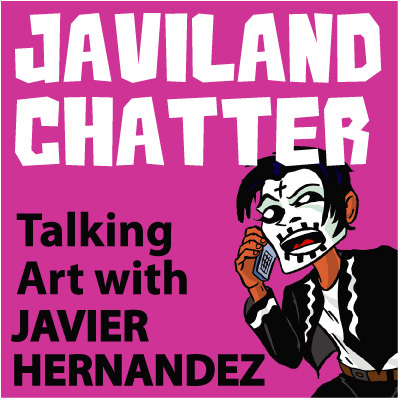 JAVILAND CHATTER: My new podcast! So I'm hosting a new podcast. After 6 years since I last hosted my own show (called JAVILAND: The podcast of DIY comics) I finally decided to jump back in with a new show. For years I had thought of doing a new show but I had convinced myself it would only happen if I went all out and bought a fancy microphone and learned how to edit the recording, and add music, etc. But as the years went by and I met new artists and writers and other creative folks, the yearning to sit down and record conversations with all these people kept calling to me. And so I decided to go back to the simple platform of Talkshoe.com and just record a conversation and upload immediately afterwards, the whole raw recording with no editing or production value added! 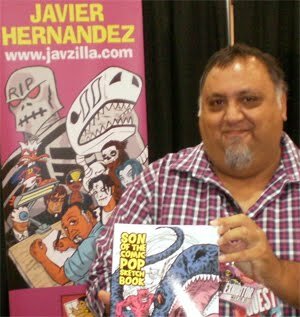 And so for the new episode of the all-new JAVILAND CHATTER I speak with Brad Dwyer, a cartoonist from Arizona whose work crosses between auto-biographic work and fantasy/monster stories! 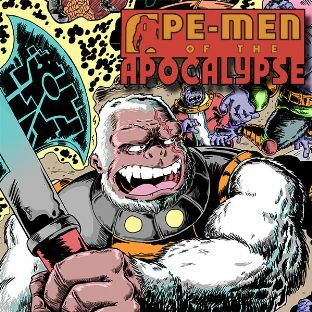 The new show won't focus exclusively on comics, although the majority of guest will be writers and cartoonists from the comics world. 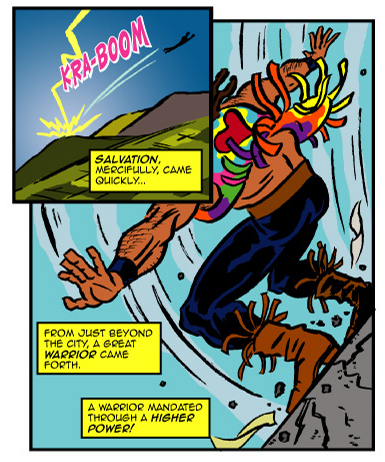 Comics are, after all, my chief passion. 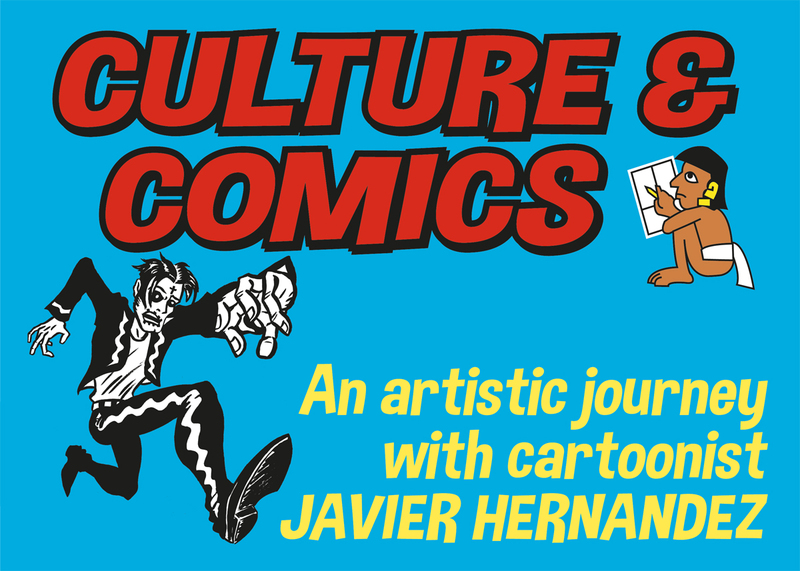 But I'll also have the show open to folks from various fields in the art world: animation, film, literary circles and wherever else I run across an interesting person who I feel I can have a stimulating conversation with. Welcome to JAVILAND CHATTER! (There's a link on that page to subscribe to the podcast via iTunes, as well).